The Australian mining company Paladin Energy and its subsidiaries along with the Malawi-based Kayelekera Uranium Project, in which it has an 85% stake, were the subject of much discussion this evening in Lilongwe at the launch of the report The Revenue Costs and Benefits of Foreign Direct Investment in the Extractive Industry in Malawi: The Case of Kayelekera Uranium Mine. The report explores what it describes as Malawi’s largest Foreign Direct Investment* and the extent to which Malawi is benefiting. It concludes that “Malawi is getting a raw deal from the mining and exploitation of uranium by Kayelekera Mine”. The report attempts to shed light on the Mining Development Agreement signed by Paladin and the government, however, no other recent reports or research exist to fact-check/verify much of the data presented in the report. In addition, the research design does not lend itself to replication to test the data and results. Yet the research does therefore expose the difficulty Malawi continues to face in maximising the benefits of the mining sector because such robust evidence is not in place or available. The Daily Times reported that Paladin Africa Ltd.’s Greg Walker, General Manager responsible for international affairs, said the company is currently reviewing the report’s contents and will issue a detailed reply later: “A brief and immediate response is to say that the report is poorly-researched, factually inaccurate and wrong in its conclusions and recommendations”. The Minister of Mining, John Bande, also had not reviewed the report at the time of interview, and noted that “We don’t even know who were involved in the research and the basis of it since we (government) were not involved”. The apparent lack of cooperation and communication between various stakeholders (government, parliament, company, civil society and researchers) in this research project, indicative perhaps of poor stakeholder engagement across the sector, will undermine efforts to ensure that mining benefits all stakeholders and the costs are shared. In this post, an overview of the launch and a short summary of the report are provided below. In Augst 2013, Paladin Energy responded to this report (see here). “Aspiring for Equitable and Sustainable Development Leading to a Prosperous Africa” was the tagline of the launch organised by the African Forum and Network on Debt and Development (AFRODAD) and the Malawi Economic Justice Network (MEJN). It was held at the Sogecoa Golden Peacock Hotel, which is ironic, from 17:00 to 19:00, 23 May 2013. About 45 parliamentarians, civil society activists, economists, academics and media representatives were present. MEJN and AFRODAD were supported by other Malawian partners including the Centre for Social Concern, Institute for Policy Interaction, Consumers Association of Malawi, Economics Association of Malawi, Malawi Council of Churches, and Centre for Human Rights and Rehabilitation. The initial findings of the report were presented in December 2012 at an international conference held by AFRODAD and MEJN in Lilongwe. This brought together parliamentarians and civil society from around Africa for two days to discuss transparency and responsible finance in the extractive sector. At the launch of the report, Dalitso Kubalasa and Collins Magalasi, the executive directors of MEJN and AFRODAD respectively, spoke briefly before AFRODAD’s Tafadzwa Chikumbu presented the research findings. This paved the way for a lively question and answer session with questions raised about whether or not parliament is ready to renegotiate the terms of the agreement with Paladin, what has happened to the man who lost his sight due to “kayelekera radiation” and if mining revenue in Malawi is therefore “dirty money”. Paladin has responded to the allegations that the eye damage was not caused by natural exposure to radiation. Since the launch of the report, a former employee at the mine was interviewed by the Daily Times and described the working conditions as a “death trap”. This report confirms what we already know: good governance will increase the development of Malawi, poor governance will do the opposite. The report should be taken as an eye-opener by the Government of Malawi. The question is what can we do to ensure natural resources benefit Malawi? The report attempts to answer this question. The report begins to shed light on the Mining Development Agreement signed by Paladin and the government, however, no other recent reports or research exist to fact-check/verify much of the data presented in the report. In addition, the research design does not lend itself to replication to test the data and results. Nevertheless, the research exposes the difficulty Malawi faces in maximising the benefits of the mining sector since robust evidence is not in place. The apparent lack of cooperation and communication between various stakeholders (government, parliament, company, civil society and researchers) in this research project will undermine efforts to ensure that the mining project benefits all stakeholders and the costs are shared. A detailed response from Paladin and the Ministry of Mining is vital to improve practice on how viable mining projects can contribute to poverty reduction and socio-economic development in Malawi, as outlined in the Malawi Mines & Minerals Policy (2013). 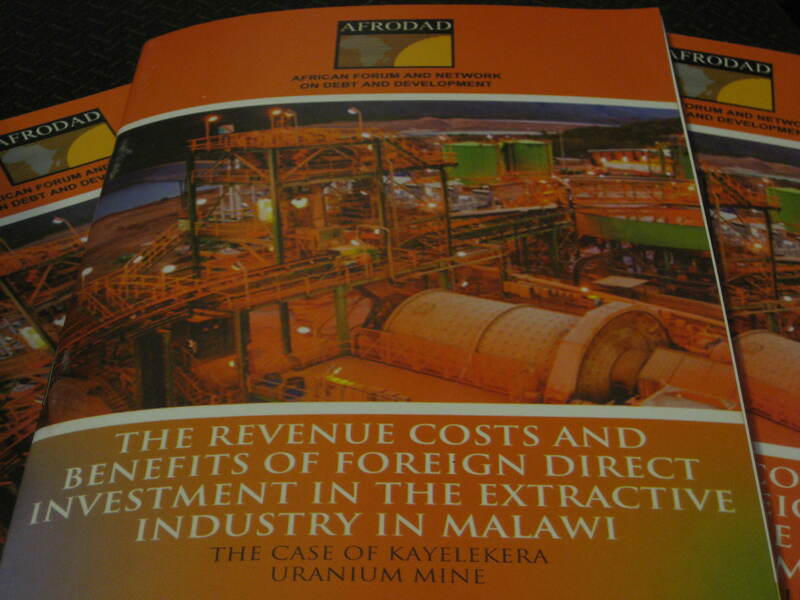 Key informant interviews, policy analysis and a literature review are the main methods used to explore the revenue costs and benefits of Kayelekera Uranium Project. The research was conducted in 2012 by a team headed up by Dr Kingdom Kwapata of the Lilongwe University of Agriculture and Natural Resources. Uranium in Malawi: In 2010, Malawi contributed 1% to world uranium production, production at Kayelekera rose by 58%, and uranium accounted for 10% of exports. In 2012, mining contributed 10% to GDP and exports but only 0.76% to government revenue and 1.2% to domestic revenue. Employment has risen in mining from 11,565 to 21,022 between 2009 and 2010; uranium employs 933 Malawians. Most of these jobs are low-paying, and most of management comprises foreigners who do not pay local income tax. The company has employed local villagers as casual labourers and paid for further training of staff in Malawi and elsewhere. 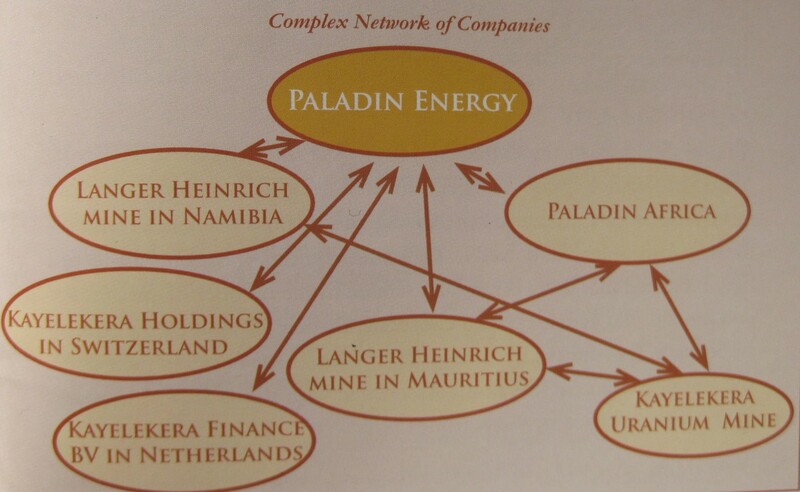 Expenditure: Between 2008 and 2012, Paladin Africa spent of USD 796,032,617 in uranium mining. Corporate tax 27.5% reduced from 30%. Since the declaration of commercial production (2009), no corporate tax has been paid but an estimated MWK 4,55 billion has been received by the Government from payroll taxes, withholding taxes and non-residence taxes. Royalty rate reduced from 5% to 1.5% (years one to three, 3% thereafter, with no increase for remained of life span of mine according to Mining Development Agreement). As of October 2012, Paladin had paid a total of MWK 800,856,231 in royalties (approx. USD 3 million given exchange rate fluctuations since 2009). If the royalties had been at 5%, the government would have received over MWK 1.3 billion more. Removal of 17% import VAT during stability period; stability period of 10 years with no increase in taxation and royalty structure. Government has a 15% stake in the mine, but has not benefited as Paladin Africa (subsidiary of Paladin Energy) has been making losses since 2009. This means that the government would not have benefits from resource rent even if it had not been reduced to zero in the Mining Development Agreement. No verification of claims that Kayelekera has given bribes to senior government officials. Community impact (mainly anecdotal evidence): increase in price of goods and services, rise in crime, prostitution and STDs, loss of biodiversity; construction of water plant; rehabilitation of primary school, airport, hospitals; construction of multipurpose hall near school and a footbridge; increase in number of banks in Karonga. Communities expected Paladin to take on services the government should provide. The challenges that are facing the mining sector in Malawi can be summed up as the lack of necessary human capital, poor linkages to the broader economy and the absence of a strong and consistently enforced legislative and regulative framework. Taxation is a problematic area highlighted by the report because the company can “avoid and evade tax and export capital through transfer mispricing using the large number of associated holding companies” (see image below); this explains how Paladin Africa is able to report that it is making a loss while Paladin Energy makes a profit. Paladin can avoid and evade tax and export capital through transfer mispricing using the large number of associated holding companies, according to the 2013 AFRODAD report. The evidence collected by the research team provided the basis for recommendations that address the royalty rate, shares and stablisation period given to Paladin, the need for a community trust fund, the establishment of a professional body to govern the extractive industry, the amendment of the Mines and Minerals Act, the enactment of legislation on thin capitalisation and improved taxation regimes, better management of community expectations, greater local ownership and share in companies, and better cooperation between government ministries and departments, among other suggestions. This page will be updated with a link to the report as soon as the report goes live. *Note: the USD 500 million investment in Kayelekera has since been surpassed by FDI from the Brazilian mining company Vale. Vale has agreed to invest USD 1 billion in a project to rehabilitate the railway in order to improve the transportation of coal between Tete, a coal-rich region in Mozambique, and Nacala Port on Mozambique’s coast; the railway cuts across southern Malawi. this report is nothing if it doesnt spur guinune dialogue between paladin and government of malawi. Thas a lie,,the company is just for the benefit of the foreigners en not malawians!! This report does not really reflect what is happening on the ground. Engage other independent researchers please.